They lived together at Southampton and at Chawton; she traveled with Jane and Cassandra in summer excursions (among other places, to Worthing); and there are many remarks about Martha and meant for Martha in yet further letters. 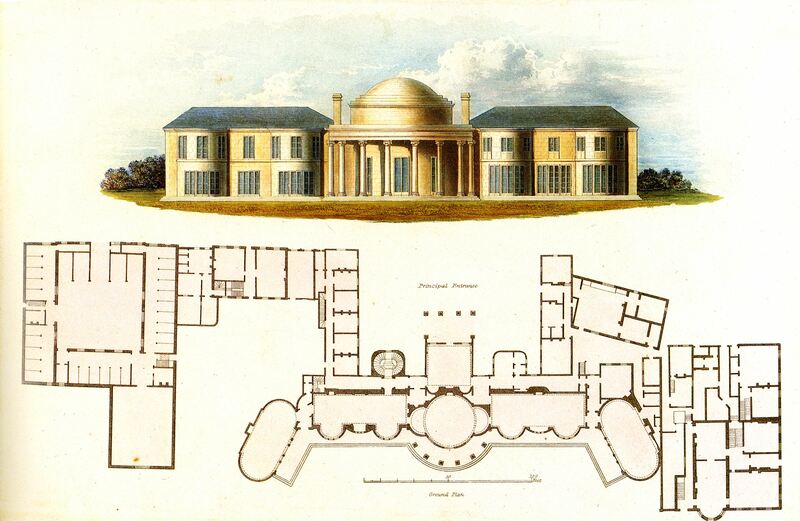 I have suggested that Jane had a implicitly lesbian relationship with Martha around 1800 and a couple of years after that, including the time at Worthing: it was Martha she slept with on the floor in the parsonage when the company was too great; we have seen Jane’s scheme of life in 1808 specifically includes Martha. We learn more about Martha as Jane writes to a specific person and her letters reflect her recipient. Catherine Hubback says as a stepmother Martha was strictly pious and anything but permissive, and here we see for the first time Austen endorsing religious language and pictures. This letter shows another step in the distancing between Jane and Martha since their time together near Steventon. It is curiously flat. In Southampton Martha had persisted in saying she wanted to marry and inventing (as Austen saw it) crushes on men (including earlier on Frank); she had insisted on conforming and, partly out of a need of money, partly perhaps to get away from the Austens, to maintain an independence, taken a position as a companion. Jane may also be careful what she says because the letter is going to Martha at her relatives in Bath and they will get to read it. It was a Dundas woman to whom Martha was a paid companion and who Martha watched die. 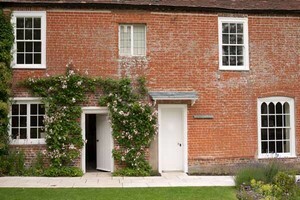 In another it’s a Dundas relation whom Martha felt she could not leave to visit Austen. One way one became a paid companion was through familial and friend’s connections — we see this in Austen’s novels. In Austen’s last mention of Martha, she can’t come for a visit in summer to which Austen also invited Anne Sharp because Martha has not been paid as yet. Miniscule as the sums were she needs it to travel. That’s in the letter where she teases that she hopes Anne Sharp’s employer will marry her. Unlikely. We see so often how Austen plans to get her women friends together and the plan falls through. At the close Austen’s letter dwells on their shared single women friends. The comment about richness I take as ironic. Last time Austen mentioned Martha it was to remark than neither she nor Anne Sharp could come for the brief period Jane longed for in summer; the obstacle in Martha’s case was she was not been paid as yet. Well now at long last Martha got her money. So Martha has made the best of this situation and her relative freedom in Bath and went overboard about how rich she now felt Jane teases her ever so lightly. It is light, lightly done, because she cares for Martha. She goes on to say at least Martha will not be too hot. Again lightly ironic as the next sentence shows: it’s been so cold this year “I must be sure there must be fires in the country.” Martha is in Bath so it’s not as chilled. And Jane has Henry’s fires in London. Then a reference to their long time in Bath together: much memories under these words: “How many alterations you must perceive in Bath! & How many People & Things gone by, must be recurring to you.” She hopes Martha will see Clifton. 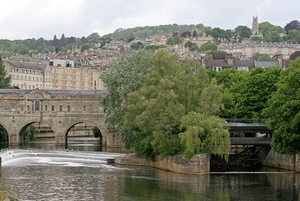 That’s a sort of semi-town near Bath for excursions. I agree with Diana Birchall there is a more straight-forward tone, slightly more graver or plain, less rebarbative & guarded. But hard to say seeing as she’s opening ironically. She is again hoping to be home at Chawton. I expect this is to get back to more writing. But maybe it’s that she does not like to be squired about as a companion, someone to be with to cross the doors as Henry meets his new ladies. Mrs Crutcheley is another woman he’s considering as a possible sweetheart and life-companion. In the previous letter the Crutchleys and Birches were mentioned in the same breath; they are families who live in close promixity and probably friends. So by way of pleasing the Crutchleys she and Henry would have gone to the Birches but the Birches are not keen. A disappointment, she says. It sounds to me like Mrs Crutchley may not be that eager to be courted by Henry. No notice by LeFaye of who or why Henry is visiting the Crutchleys. The last letter (105, 23-24 August 1814) was more enigmatic about why Henry was going to the Crutchleys and Birches, but now Jane knows Henry is clearly about courting. Why LeFaye does not want to see it or us to see it I cannot say. As I wrote, Nokes does mention this is a courtship adumbrated at the time of Harriet Moore but he has nothing more than to call our attention to it to show an aspect of Henry. Henry also not eager to be along so when he brings back James as it appears Cassandra is not coming after all (remember Austen’s dubious tone about that in the last letter). James has dentistry problems. The twelve days were pleasant she says and we get a little summary. Tilsons. She did have to see Mr Hampson but notice now that Jane is not talking to a sister, she drops the sarcasm and doesn’t let on she didn’t want this association. Jane Austen writes letters by association and the Bridges come to mind as relatives she does want to have connection with, does want to see and she tells Martha that Henry met with Sir and Lady by chance and had they remained in town there would have been a dinner. But again no such thing. Her amusement at extravagant styles of female dress. Another hit at Mrs Latouches. The lady in the last letter who was not getting visitors. Well at her house they pay attention to such stuff and having been there these are Jane’s observations — she likes the broad-band stripes. You can see this fashion in some of the costume dramas. Two wide swathes of cloth across the front of the chest over the waist. Poldark the second season (1977-78) has the upper class lady (Elizabeth Warleggan) dressed this way — and it is supposed to be early 19th century. A highly unusual passage for Jane Austen: she has been talking about what tastes she likes and by association (how the letters proceed) she moves to discourse about solemn religious painting done in the grand historical style. I suggest Martha liked these or mentioned them in her letter. For Jane’s part, in this sort of picture what she likes best is Christ Rejected. 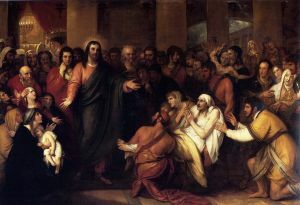 Martha seems to have wanted to know if Christ Healing the Sick is considered superior — hinting perhaps that she, Martha, preferred it. This is the first letter thus far where we get explicitly religious language by Jane Austen: “Our saviour.” She says Christ Rejected is the first painting of this type which gratified her. What she sees as different from the others is hard to say: the figures are smaller, more realistic perhaps? better drawn? Both are melodramatic and descend from the Baroque. See Austen Only on Benjamin West and Austen. Also Persuasions Online articles cited by Diana Birchall. Back to Henry and his house. Jane likes Hans Place better than Henrietta Street — as we saw in the last letter: For a start she has a larger room, and there is the garden. Jane only wishes Henry would continue in as good health. His health was bad for quite a time after Eliza’s death (as it was put then) and Jane reports that Henry says he is better than he’s been for over a year. The way it’s put injects a slight note of doubt. Henry is often presented as this gay and cheerful person. From what he writes in the Loiterers, to Hastings, and what we’ve seen in these letters there is not much proof of that. 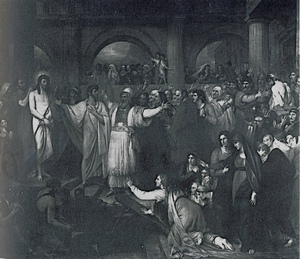 In the early weeks after Eliza’s death he did not want to go to parties but had to for business. He is not as cheerful as Jane as they go walking but only keeping up. Now we hear his view of the American war is not as cheerful. LeFaye is puzzled and it is true that war had not been declared, but it was clearly in the offing. This is part of that “American situation” quotation from MP that also has not been specifically explained. If we can’t explain it fully that does not mean it’s mysterious. The American and Brits deeply resented one another by this point, and were revving up for trade and sea war. The US people first attacked Canada though – -that’s not much noticed — the expansive violent impulse showed very early. Jane is repeating Henry’s view: by going to war we win nothing only teach the US how to go to war at sea. I doubt they needed the British to teach them. Well, says, Jane if we are to ruined it is not to be helped. And we get more religious talk which we’ve not heard before. It seems Jane Austen is of the opinion the British are more religious than the Americans and so Heaven will protect the Brits. Not exactly a great political thought, but people write to someone. This is written to Martha who had been talking of a religious picture she liked so this line of thought is one which may please Martha. We may say it’s unusual for Jane to try to please in this way. But then we have so few letters to people outside her family. Martha is a beloved friend; they have squabbled; Martha can rarely come to see Jane so Jane writes out of understood common ground. However this may be — Jane is like someone who cares more about her cat than a coming war– what matters is Mr Barlowe comes to dine today. Barlowe an employee — so again Henry socializing to network. And now Jane has business too (the association too): she hopes to hav Egerton’s account to see how her MP is doing. Again she and Henry will try to enjoy themselves despite what may happen or not happen at business. We have not heard about Aunt Jane-Perrot in a while: it’s no surprise to be told the Aunt was not keen on Martha’s relatives taking a house in Bath. Jealous? Inexplicable resentments? Well, the Dunstans did not have Mrs Perrot i mind, did they? Jane put this unusually mildly put: “I was afraid she would not like it” so we don’t get a sense of the acid envy that we usually do. Again it is a letter Jane expects Martha’s relatives will see. So, at any rate Jane hopes Martha’s relatives will like Bath. And then suddenly the letter is cut and censored. Who will Jane hear about that Martha wants to know about? could it be Frank? Martha married Frank many years later? or her sister, James’s wife? This is a letter which comes down from Frank’s family so my guess is it’s some sentimental feeling Martha hankers for Frank. Then we are not to know who Austen will find herself with or what she said about that lady in the hovel always glad to come to tea (for food) Miss Benn. These two women bring to mind another genteel impoverished unmarried woman: Miss Irvine. Dear me says Jane. She is likely at this time of year to be more out of Bath than in. This feels like an answer to something Martha said. The two of them talking about another single woman. There is a strong feeling frmo the opening on that Martha does like Bath this time round — confirmed by the ironic response at Jane’s beginning to Martha’s probable assertions at how happy, rich, comfortable she was in Bath. Now another lady friend of theirs, one no longer single: poor Catherine Bigg, as we saw from Jane’s ditties written just before Catherine married and other remarks since Jane did not envy Catherine’s marriage to the old man and endless children whose grandfather he really could be. Jane admits she is well, comfortable, but is dismayed to see the husband. 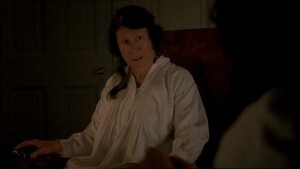 A post script: Jane now remembers again to give her regards to Martha’s friends. (The regard which no one carries Mr Knightley’s comment comes to mind.). She is grateful to them as an author. More likely than naval information I suggest they bought the novels. And then (as an afterthought) she recalls Charles’s wife had her baby early on board a fortnight early. Poor woman, not much fun that. And de-emphasized here. How have the two friends traveled since 1798-99 when Jane wrote so passionately and they walked and talked and poured their thoughts into one another for hours — just before the blow over Steventon happened, which visit I now surmise was allowed in order to give Jane the high ecstatic time before the Mr Austen’s decision to give his oldest son what he could was announced. 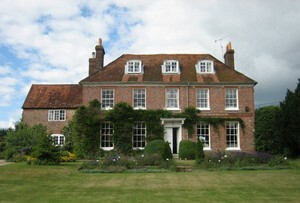 Then Martha was in a large vicarage and Jane in one she thought at least securely her home. Diana Birchall’s reading and paraphrase. At long last I have made a new section on my website. It will be a kind of online anthology of women poets, beginning in classical or the earliest recorded time we have and continuing to today. I call it “From The Woman’s Canon,” for it can represent only a small part of a canon that itself doesn’t properly exist. 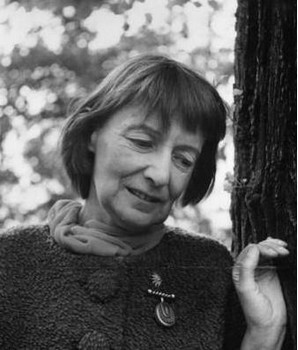 Paula Backscheider (whose Eighteenth Century Women Poets and their Poetry I reviewed) is just one of many women scholars who have demonstrated that a large and varied women’s canon would exist but that much of it has been destroyed and what was left censored, with its original perspectives changed, often reversed. I probably first became aware of this when a couple of years after finishing graduate school (1982) I discovered that there had been quite a number of Renaissance women poets, and a number of these had large oeuvres of poetry. No one had said anything about such a group when I was in graduate school, and for a time I majored in the Renaissance. by 1984 I had begun to go once, twice, perhaps three times a week to the Library of Congress to do research on Anne Finch whose poetry I had fallen in love with while doing my dissertation on Samuel Richardson’s Clarissa and Grandison. 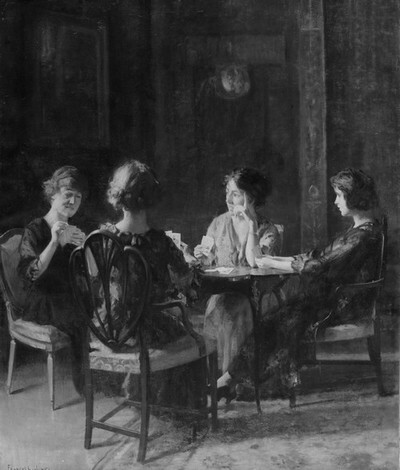 During that time I had learned there were many women novelists who were good and had written fine novels; but their works were no longer available and what one could learn of their lives was the result of very recent compilations, surveys, books like Mothers of the Novel by Dale Spender. Now I began to discover more women poets, 17th through 18th century and many poetry that I loved and thought superb. They often took a woman’s view of the world. Among the critics I read then to whom I was grateful for her work was Germain Greer (whose picture you see heading this blog). Well that was 30 years ago, and I’ve gone on to read many feminist (and not so feminist) histories of women’s literature, and seen an explosion in publication of women’s writing. I have myself now translated the complete poetry of two Renaissance women (Vittoria Colonna and Veronica Gambara), done original researching on the still unpublished writing of a great 18th century poet, Anne Finch, and written for conventional publication as well as here online about many women writers. I find especial solace and strength and write about women’s life-writing, novels, films, but poetry remains my special love. and sometime during 2005 I began to write short lives of women poets to which I attached what I thought were their best or most characteristic poems and evaluative commentary. I would also offer a list of essays or books by or essays on these poets, or anthologies which included them. I put these on my first blog, Ellen and Jim Have a Blog, Too (see remnant of part of blog devoted to Jane Austen). It was probably around 2005 I joined Wom-po, a listserv community devoted to talking about and sharing women’s poetry, and there I met the listowner, Annie Finch, poet and translator who had declared Wednesday to be a day for us all to share poems by women. She was committed to recovering a woman poets poetic tradition, to the reality that women “think back through our mothers” as writers, readers, artists.S She had declared Wednesday to be a day for us all to share poems by women. After I began to post, she declared Friday to be a day for posting poems about and lives of “foremother poets.” The custom continued for some months, but after that most of the people only contributed now and again. I was one of the people who contributed consistently and by the time of the First Annual Festival of Women’s Poetry (online), had with thirty lives and poetry ready to be put on the site. Since then I’ve written more of these little lives, posting them to Wom-po and also the listservs I moderate (at Yahoo: Eighteenth Century Worlds, Women Writers through the Ages, Trollope19thCStudies), and when I opened my new blogs I began on Fridays to write them regularly (Ellen and Jim have a blog, Two, and Reveries Under the Sign of Austen). Now, in order to make these visible to others, to have one single handy place to reach them, and to fill in unnoticed gaps, I have decided to gather all I’ve done on my website onto this one place. Anthologies, Handbooks, Histories & Essays, Blogs & Periodicals. I had early on when I first made my website (1995-96), put together a bibliography of women’s literature. This was simply intended to help other researchers do research on any and all women writers; its origin in my studies of Renaissance literature is reflected in the choices, but it is wide-ranging and attempts to supplement all sorts of causes. This new site is narrower and perhaps shows my experience over the past 15 years of life on the Net, socializing with writers, readers, editors, publishers, and may useful for those coming to it beyond any needs for research or specific knowledge. In Annie Finch’s “How to create a Poetic Tradition,” Finch demonstrates how central to visibility and thus a perceptible, findable, and usable context for writers and readers is “the entire literary apparatus of reviews, anthologies, journals, histories, panels, conferences, encyclopedias and textbooks.” Anthologies which are 90% male and where the choice of poem is often an unacknowledged masculinist bias (presented as universal or general) cripple the woman writer. Anthologies, handbooks, histories of literature come out of people’s desires, respect, point of view, what they think others will value. So the context is the manifestation of living people and people in the past reading, writing, talking, acting together: “numerous small acts of persistence … To edit, write, and create this apparatus is creative and fulfilling work in itself and tends to enrich a poet’s poetry.” I hope also to enrich other women’s lives as readers, as people, to be able to find a book or text that really speaks home to her. 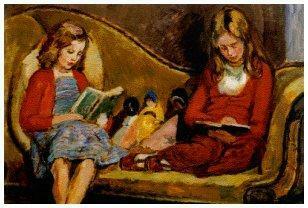 The site is intended to help reading girls and now women especially not feel alone in their particular sensibility. 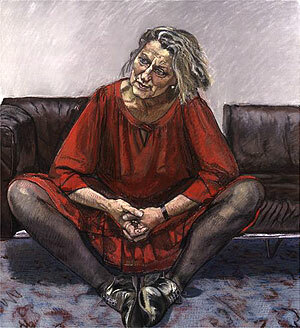 If you want to find the books that Germaine Greer wrote as a feminist and specific research on feminism or any women writer, go to the bibliography; if you want to reach a picture of the woman’s poetry canon join in this is yet another place on my site where you will find women thought to be unusual because they were writers but whose lives were like your own in many ways gathered together. My speciality has for the last 15 years been the 18th century, and I read French fluently and Italian pretty well, but would be happy to add material for other languages and women poets beyond my three. I realize how weak my site is in German anthologies, to say nothing of non-European texts. If anyone knows of an anthology of women’s poetry you think ought to be included, please to let me know. The sole criteria is that it should be an anthology, history, handbook devoted to women poets. I know I have already broken this “rule” (consistency is a bugbear &c), but in the couple of cases where I did there were so many women poets in the supposed general anthology and the selection seemed so good or important I cited it; also I have a few general histories of women’s literature because they include many women poets or are historically important. I have written about girls’ books and hope to make include this special and important subset of women, of whom I once was one. (See also Deborah O’Keefe, Good Girl Messages and Maureen Corrigan’s Leave Me Alone, I’m Reading) I have two (biological) daughters of my own. Heads of topics: She wishes she could help Cassandra with the 11 children; a free thimble. They are waiting on Chawton; mother putting together some “useless silver” (ware). 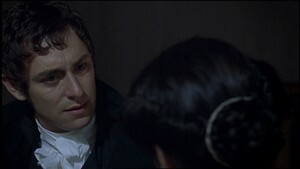 Austen identifies with Miss Murden (single, broke, has to take a job as a chemist’s wife’s companion; this where she talks in sign language to an impoverished deaf man in a boarding house and recommends Stael’s Corinna; she eats black butter with Eliza (rejoicing in “unpretending privacy”); Henry still distressed, James has been and gone to the theater. There are still many destroyed letters. Writing novels never mentioned, yet we have evidence she writes all morning regularly . . .
One feels endlessly compelled to qualify. On Austen-l we had a thread on whether the letters are superficial (I really meant to counter the typical dismissal of them as joking, not meaning it, meant for family eyes &c&c) or unsatisfying, as I started this week’s letters I looked at the dates. By LeFaye’s own computation in her introduction to this edition, that means probably 6 missing letters. 2-4 a week, or 3 a week is what LeFaye figures. If we start to count on average often 6 missing, for the break here of 3 weeks is typical, we can really make no generalization of what the whole was. We can say this remnant is meager in numbers. I hope he comes to you in good health & in spirits as good as a first return to Godmersham can allow. With his nephews, he will force himself to be chearful, til he really is so. Myself I see no reason to think he was boulverse by Elizabeth’s death; we are not near Eliza’s fatal illness, though her disabled son was a burden and died. We do know he overextended himself, that his business was very stressful one (considering the wars, over-building) and in the end he opted for retirement to a small income as a curate and nobody wife, living near his sister. I cannot say that I am in any hurry for the conclusion of her present visit, but I was truly glad to see her comfortable in Mind & spirits. — at her age perhaps one may be as friendless oneself, & in similar circumstances quite as captious. Given the mortality rate, Austen could find herself w/o a brother willing to put up with her, Cassandra dead, mother dead and she’d be as badly off. She is “one” in the second phrase. I had not noticed before the “I recommended him to read Corinna” is said to an impoverished deaf man, Mr Fitzhugh. His family is willing barely to support him — as little real concern for disabled people then as now. Jane’s using sign language shows it has spread — it was invented mid-18th century by three philosophes altogether and simply transformed the existence of deaf people. No longer left to be idiots. That she knows it is startling. But it’s telling him to read it. I had once read she preferred it to Milton but know that reading is wrong since she never mentions Milton in this sentence. I’ve read Corinne and can see how it would be a comfort to an intelligent person. A deeply philosophical travel book about non-conformity. I wonder how he would have learned to read, where? would someone read it to him through sign language? 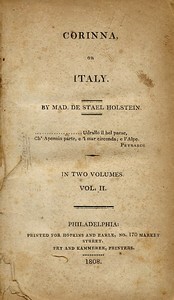 I know it existed in English by 1808 – and probably this was the copy Austen was thinking of. I see no real buoyancy in this letter on the whole. It is the same mixture as the previous. In fact Chawton is not primarily what’s on her mind. Here we see other people are; what she is doing when she writes is kept from us. The 6 missing letters could have been about that or contained something we’ll now never know. 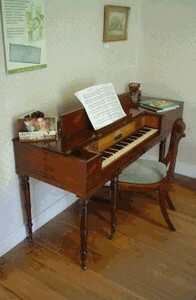 Yes, yes, we will (underlined by Austen) have a Pianoforte, as good a one as can be got for 30 Guineas. throughout does not suggest any continual rejoicing at the coming move. This is a less pleasant letter than the last. The abrupt irritated tone especially strong on Tuesday. Austen moderates somewhat on Wednesday, but not a lot. I can now write at leisure & make the most of my subjects, which is lucky, as they are not numerous this week. Our house was cleared by half-past Eleven on saturday, & we had the satisfaction of hearing yesterday, that the party reached home in safety, soon after 5. LeFaye suggests James and his wife, Mary, but two letters ago (Letter 61) only James is there, and that allows him to go to the theater (Mary did not like books & poetry & we’ve no reason to believe plays found any more favor with her) Austen says her brother, James is there alone and this will give her a chance to see that Martha goes to the theater in Southampton at least once. Rereading that passage, maybe after all Jane did go to the theater more often that we suppose. Her remarks would be destroyed by Cassandra: theater going not acceptable? salacious innuendos? hard to say. I was very glad of your letter this morning, for my Mother taking medicine, Eliza keeping her bed with a cold, & Choles not coming, made us rather dull & dependent on the post. You tell me much that gives me pleasure, but I think not much to answer.-I wish I could help you in your Needlework, I have two hands & a new Thimble that lead a very easy life. Eliza and Choles are both servants. Jane suggests they or he provides amusement and interest. Again she’s not above noticing servants. Needlework: I can imagine Cassandra has a lot: 11 children! At least one still in diapers. And maybe more than one not yet in trousers. Lady Sondes’ match surprises, but does not offend me; — had her first marriage been of affection, or had there been a grown-up single daughter, I should not have forgiven her — but I consider everybody as having a right to marry once in their Lives for Love, if they can — & provided she will now leave off having bad head-aches & being pathetic, I can allow her, I can wish her to be happy. of ignoring their miseries as nothing. It was in her monetary interest to. I hope Jane’s dislike of the name of Montresor is not a dislike of a French name but fear this is so. Brook Bridges. No reader — perhaps like Elizabeth (now dead). She, Jane, cannot believe he is really reading. In a way it’s amusing. I’m glad she’s no hypocrite. -I heard from Portsmouth yesterday, & as I am to send them more cloathes, they cannot be expecting a very early return to us. Mary’s face is pretty well, but she must have suffered a great deal with it-an abscess was formed & open’d. I imagine a bad tooth. The Austens did have access to what was known of tooth care and we see Jane going to the dentist in London; in her later letters she is aware of how little they can do. Then the long passage on Miss Murden. Again I surmise a Cassandra having written that she longs to hear about this party and can hardly wait to know about the treats they ate. Austen again is not having this. What I like about this letter is Austen is not writing to please Cassandra but countering her step-by-step (or should I say line-by-line — as she seems to have Cassandra’s letter in front of her as she writes? Miss Murden was related to the Fowles; Eliza Fowles’s gain was a sister-in-law; Miss Murden’s was that she didn’t attract a man or had a relative-possible suitor sluiced off (by marriage) — could she have wanted Cassandra’s Tom? Well, irritatingly sullen Miss Murden — sitting there ungracious, very silent, Jane suddenly shows she identifies with in the second passage. Miss Murden was understandably distressed I’d call it; like many of these single women the Austens surround themselves with, she has no money, and Martha has found for her a way of surviving by being companion to, Mrs Hookey, the Chemist. Not exactly going up in life. Our Eveng party on Thursday, produced nothing more remarkable than Miss Murden’s coming too, tho’ she had declined it bsolutely in the morng, & sitting very ungracious & very silent with us from 7 o’clock, till half after ll-for so late was it, oweing to the Chairmen, before we got rid of them. Some of Austen’s irritation comes from the money she has not got and others still have plenty of. Remember the aunt has granted an annuity to him of 100 pounds (and that means Mary too). She did not do similarly to the Austen mother and sisters, did she? James however does not have the money to get one for a boy, so Edward will be compelled to actually make good on his promise. The “which makes us very happy” is sheer acid. Mary does not like gardens any more than books. I imagine she didn’t like the degrading work? because of the reference to trenching to be done by his own servants. So John Bond is still there to be used. 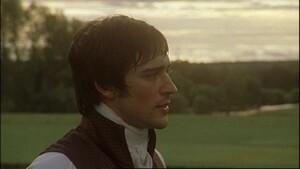 Mr Austen talked of him with some feeling of his equality as a human being. ]ames means to keep three Horses on this increase of income, at present he has but one; Mary wishes the other two to be fit to carry Women-& in the purchase of one, Edward will probably be called upon to fulfil his promise to his Godson.5 We have now pretty well ascertained]ames’s Income to be Eleven Hundred Pounds, curate paid, which makes us very happy-the ascertainment as well as the Income.-Mary does not talk of the Garden, it may well be a disagreable subject to her-but her Husband is persuaded that nothing is wanting to make the first new one Good, but trenching, which is to be done by his own servants &]ohn Bond by degrees-not at the expense which trenching the other, amounted to. And two more sections, one on a ball Austen is glad for Anna she will have. Anna has much to endure with that stepmother (left out of Godmersham). No shoes from mother Mary, but mrs Hulbert will bring a pair. The tone here is much much pleasanter; there is kindness and Austen is looks forward to Chawton in a longish passage, but I’d like to suggest there is just as much dwelling on the here and now and what seems to make soften her is her real engagement with a poor, deaf man who might just be interested in a serious book; a poor single woman captious but who now has a place somewhere and whom she sees what she could be in the future — that she does this suggests she by no means had faith the Chawton scheme would a permanent secure home for her. After al she had been thrown out of Steventon. As a woman she owns nothing; single, she is not directly linked to a man who might protect her interests as the equivalent of his. She is however probably ironic when she says she looks forward equally to her coming association with the Digweed’s bailiff and bailiff’s wife (they are going to live in a bailiff’s cottage) as with Digweed himself. This shows again why she identifies with Miss Murden and after the sudden decisive yes we will have a pianoforte, it’s all money, Henry’s grief, snow and how speculation passes the time. So here are the passages to exemplilfy what I’ve suggested above. I’ve talked of Mr Fitzhugh and now I’ve looked up the women. Mrs Drew a resident in the boarding house (so no status), Miss Hook, daughter of a brigadier general, but she died in 1816 so perhaps aging single (sloughed off old maid), Mr Wynne, another resident. 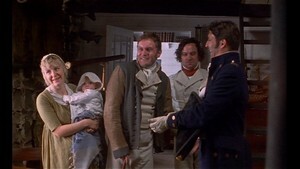 Why do the film-makers not make a truthful film about Austen’s life. I can see Bergmann doing it or Bresson. We spent friday Eveng with our friends at the Boarding House, & our curiosity was gratified by the sight of their fellow-inmates, Mrs Drew & Miss Hook, Mr Wynne & M’ Fitzhugh, the latter is brother to Mrs Lance, & very much the Gentleman. He has lived in that House more than twenty years, & poor Man, is so totally deaf, that they say he Cd not hear a Cannon, were it fired dose to him; having no cannon at hand to make the experiment, I took it for granted, & talked to him a little with my fingers, which was funny enough.-I recommended .him to read .Corinna.9-Miss Hook is a wellbehaved, genteelish Woman; Mrs Drew wellbehaved without being at all genteel. Mr Wynne seems a chatty, & rather familiar young Man. If we look at the above one and then this we see Austen surrounded by people glad, grateful, condescending, not above her, that she’s comfortable with them (not threatened). Like Eliza, they would have been glad to eat black butter with her in front of a fire. My Mother has been lately adding to her possessions in plate-a whole Tablespoon & a whole dessert-spoon, & six whole Teaspoons, which , makes our sideboard border on the Magnificent. 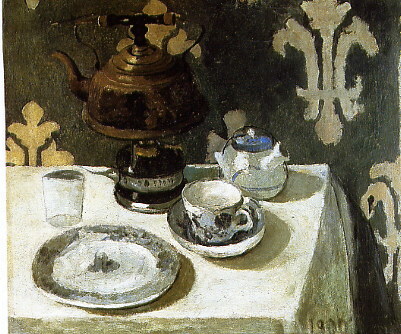 They were mostly the produce of old, or useless silver, –I have turned the l1s in the List into ” 12s, & the Card looks all the better; — A silver Tea-Ladle is also added, which will at least answer the purpose of making us sometimes think of John Warren. And then the longish passage of looking forward to Chawton: There is much wry saturnine here. She is comically irritated by Cassandra’s discretion (it is only comically). The reality is they will not have much satisfaction in neighbors for real, and the irony of who they run with now. Not that she doesn’t like “remarkably good sort of people.” So did Emma the Coles (and found she had to bow to the neighborhood who persisted in treating them as equals so she had to pretend). The country dances anticipates Anne Elliot at the piano, minus the grief of a Captain Wentworth’s mortifying presence nearby. What picture emerges from the life of Chawton: surrounded by non-genteel, looking to new family generation for social amusement. No sense that this is the place she will dig in and write those novels. No elation felt but for the piano. I shall not tell you anything more of Wm Digweed’s China, as your Silence on the subject makes you unworthy of it. 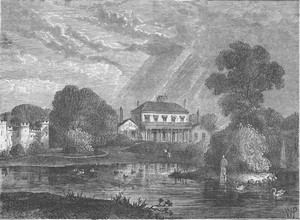 Mrs H. Digweed looks forward with great satisfaction to our being her neighbours — I would have her enjoy the idea to the utmost, as I suspect there will not much in the reality.-With equal pleasure we anticipate an intimacy with her Husband’s Bailiff & his wife, who live close by us, & are said to be remarkably good sort of people. — Yes, yes, we will have a Pianoforte, ( as good a one as can be got for 30 Guineas — & I will practise country dances, that we may have some amusement for our nephews & neices, & when we have the pleasure of their company. Martha tells Henry he will soon have a bill from Miss Chaplin (a shopkeeper) but not to worry the bill will probably not be redeemed at the bank right away. Henry’s money is not in the good shape some believe, and then how children act as an enforced inhibitor and good thing too. Human beings pavlovian. Eliza is Henry’s wife and has not written in a while. She has sombered up over the years — dead son, melancholy husband running about to try to make a middle class household and living. We have had Snow on the Ground here almost a week, it is now going, but Southampton must boast no longer. 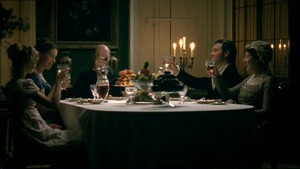 Remembering again Edward, his sons and them passing the time playing speculation — as they did in Mansfield Park. Do we have to make explicit that Godmersham is Mansfield Park and vice versa? A PS on the mother growing older: not gone out of doors this week (real life here) but “keeps pretty well.” So less hypochondria, less indulged probably. Bookham is Mrs Elizabeth Leigh of Adlestrop. She is Cassandra’s godmother — part of the general relatives group of Cookes, Leighs, Austens. She too never married, lived with her brother, Thomas, in the rectory at Adlestrop, was much older — so we understand the association with Austen’s mother. It’s an in the midst of life letter. Jane Austen has been reading Stael’s Corinna. As the letter opens she feels for Cassandra stuck at Godmersham, sewing, taking care of 11 children. She, Jane, would do some of the sewing for her if she could. She has a thimble. She has enjoyed a party despite the boredom of the people and later in the letter she becomes more eager. The missing element is the lack of talk about writing, about her novels. It’s so empty of this I feel she’s deliberately keeping this part of her life out of sight. Only the reference to Corinna and her use of sign language brings in her life of the mind. I can see why she is not depending on Chawton for a new way of life as yet. She had to turn herself around too — to become more publicly pro-active to make her books and publish them. My google mail disappeared for number of hours and that has given me quite a scare. I got a frozen message for many hours which claimed to be fixing an error in my mail storage. So anyone who wants to contact me, please remember that I have two other addresses available on two further site: beyond ellen.moody@gmail, there’s Ellen2@JimandEllen.org or emoody@gmu.edu.